Traction alopecia term is used to know the form of hair loss. Alopecia refers to any hair loss, independent of the cause. The term traction shows the result of hair loss of pulling on the scalp hair. Traction alopecia generally happens during hairstyling and the use of chemical and nylon brushes. It develops in years or even decades. During the early stages, the hair loss is reversible but in many cases, the hair loss can be permanent. If the problem will be known and can be recognized as early as possible then there is a change in the decrease of permanent loss. During the early stage of traction alopecia, no symptoms of traction alopecia but some patients experience the itching problem and redness on the scalp. When the skin affects the area they the broken hair become visible and the hair follicles shrink or scarred. In this condition, the hair follicles will no longer produce typical and coarse hair. Generally, the hair loss pattern of traction alopecia happens at each individual with a specific pattern. This problem is more common hair loss in women than men. This happens because when women use different hairstyle product on hair such as braiding and curling. Traction alopecia happens only on hairstyles as it pulls down the hair from the skin of the scalp. This problem is associated with braids, weaves, and dreadlocks. However, some other styles like ponytails, long hairstyle also cause traction alopecia. Some culprits are Helmets and turbans. -Patchy hair or thin hair near the hairline. These symptoms when you notice they you have to take immediate action. These problems can be solved with the doctor only and it will usually be increased and the changes in severity can even make permanent hair loss. When the scarring problem occurs the treatment will be more difficult and in these cases, medical intervention is required. Only a hair restoration expert can help to treat the problem. You can treat the problem as early you will be aware of it. In this traction alopecia can be solved without a doctor. In this, there is no scarring and no pain or swelling happens. This simple can be avoidable only not doing hairstyles as it increases the scalp tension. However, you need to be patient as your hair need time to grow and it can take months or even a year to see the process of hair. At this time you don’t need to wear. Always try to make your hair free. When the traction alopecia comes to a point where there will be a pain, swelling then you will not see any hair growth on the scalp. This will be the alarm for your hair and need an immediate consultation with a doctor. During consulting with a doctor you need to go with a test which ensures that problem arises only with traction alopecia. In this case, it includes a biopsy of your scalp, where a small sample is taken and submitted to the lab for examination. When the diagnosed happens then different typical treatment provided. -Minoxidil like topical hair growth given to use on scalp. – Natural hair growth supplements provided like Biotin. -To reduce the inflammation on the scalp doctor provide oral or topical medications. If scarring occurred then there is no pills or creams will help to bring the hair at any cost. This the permanent damage of hair. The only possible way to reverse hair is hair transplant. Through this invasive surgery you can get your hair back and in this surgery a high success rate of hair transplant involves. It makes the appearance look good and natural. 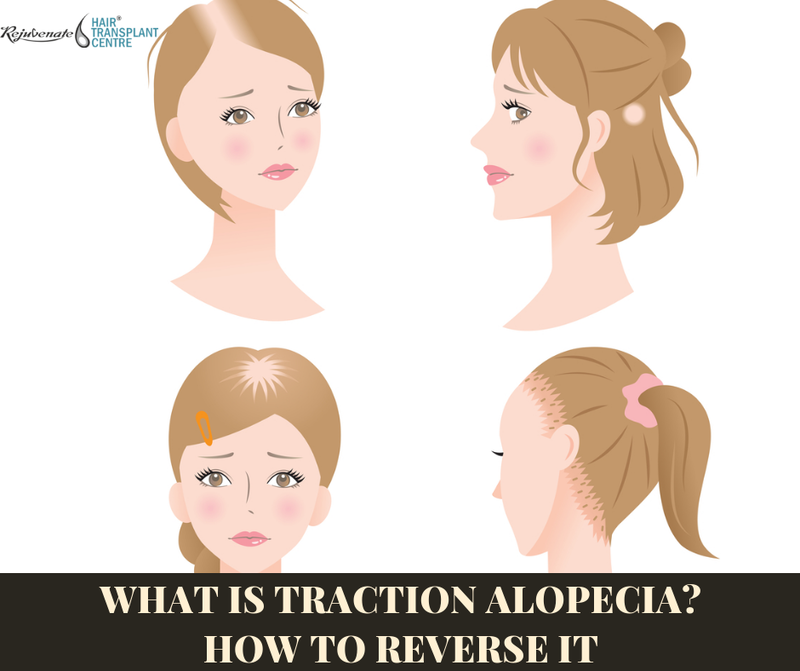 Traction alopecia is preventable but it doesn’t mean that you give up the hairstyle but it only means that you need to take a full break from daily hairstyling. The gap is required for healthy hair as it makes the balance in hair follicles. The hairstyle can be done on an occasional basis. Implement the hairstyle in such a way which decrease the damage of hair and try always not to pull your hair too tightly as it causes the problem seriously.